With eight other planets, dozens of moons, thousands of minor planets, myriads of comets and meteoroids and in addition interplanetary dust which circle around a central star named the Sun, Venus is a member of a collection of celestial objects which is called the Solar System. It extends over 12,000 million kilometres in space. Counting from the Sun, Venus is the second planet. Venus' orbit is the most circular of any planet, with an eccentricity of less than 1%. The dominant body is the Sun which accounts for more than 99% of the mass of the Solar System. 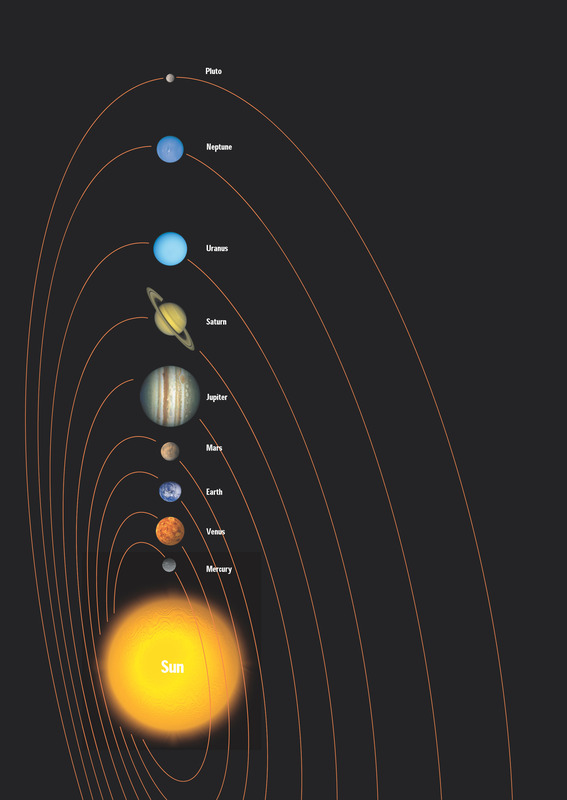 Our Solar System was once regarded as the largest and central part of the Universe. But today we know it is just a tiny speck compared with the rest of the Universe. Venus belongs to the group of planets from Mercury to Saturn that are bright and easily seen by the naked eye, and well known to the ancients. The three most distant planets - Uranus, Neptune, and Pluto - were discovered after the invention of the telescope in 1609. Uranus and Neptune can be seen with a pair of binoculars, but to detect Pluto requires a moderately-sized telescope. Compared to the Sun, Venus and the other planets are relatively cold and only visible by reflected sunlight. To observers on Earth, both Venus and Mercury show phases like the Moon, because their orbits lie inside the Earth's orbit. So Venus and Mercury are called inferior planets. On the other hand, Mars, Jupiter, Saturn, Uranus and Neptune lie outside, so they are called superior planets. All planets except Venus rotate from west to east. 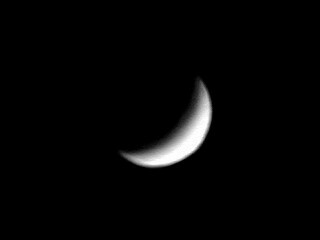 At 243 days, Venus has the longest rotation period; the shortest is Jupiter's at 9 hours 55 minutes. A more meaningful classification scheme is based upon the physical properties of the planets whereby the family of planets can be divided into two different groups. 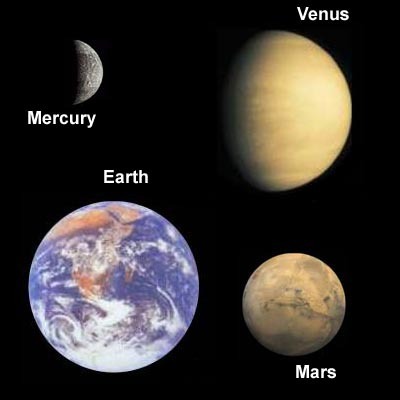 Mercury, Venus, Earth, and Mars are called terrestrial (Earth-like) planets. They have solid surfaces, are all basically spheres of rock with iron cores, are of similar size (their diameters range from 5000 to 12.000 km), and they have quite a high mean density (4000-5000 kg m -3 ; the density of water is 1000 kg m -3 ). Apart from their similar size, the terrestrial planets posses few, if any, satellites and all rotate with periods of a day or longer. With the exception of Venus, their atmospheres are much less dense than those of the Jovian planets. Finally, the terrestrial planets are all relatively close to the Sun. Mars, the most distant, is only half as far again from the Sun as is the Earth. The planets from Jupiter to Neptune are called Jovian (Jupiter-like) or giant planets. They differ dramatically from the terrestrial ones. They are all considerably larger than the Earth in both radius and mass. The smallest has nearly four times the Earth's radius and fourteen times its mass. The densities of the giant planets are about 1000-2000 kg m -3 and most of their volume is liquid. Most possess well-developed families of satellites. In fact, Jupiter and Saturn with their moons are nearly like miniature solar systems. The most striking difference appears in the structures and atmospheres of the Jovian planets. Jupiter and Saturn have no well-defined surfaces. All Jovian planets have deep, dense atmospheres rich in hydrogen, helium and gaseous hydrogen compounds. The atmospheres are thought to merge smoothly into a liquid and then a solid interior, with little evidence of the rocky matter found in terrestrial planets. Pluto is a unique object falling outside this classification. Very likely, Pluto belongs to the family of icy bodies orbiting the Sun at the outer edges of the solar system. Looking down on the north pole of the Earth, we can say that the planets revolve around the Sun in a counter-clockwise direction - west to east. The orbital velocities of the planets range from about 48 km/s for Mercury to 5 km/s for Pluto. The mean orbital velocity of Venus is 35.02 km/s. The orbits of all the planets lie very close to the plane of Ecliptic. Pluto's orbit, at 17°09', has the greatest angle of inclination to the Ecliptic. Although all planetary orbits are elliptical, most of them are almost circular. The eccentricities range from 0.007 for Venus, which is the most circular, to 0.249 for Pluto, which is the most eccentric, and all are less than 0.1 except for Mercury and Pluto. Mercury has the shortest period of revolution (about 88 days), and Pluto has the longest (about 248 years). To locate the positions of a planet in its orbit relative to the Earth and the Sun, special positions, called configurations, have been defined. When a planet, as seen from the Earth, is in the same direction as the Sun, we have a conjunction. When an inner or inferior planet - that is Mercury or Venus - is on the near side of the Sun or passes between the Sun and the Earth, we have an inferior conjunction. Since the dark side of the planet points in our direction it is invisible. When the planet is on the far side of the Sun - on the opposite side of the Sun from the Earth - we have a superior conjunction and it is again invisible to Earth-bound observers. As the planet moves away from conjunction, its angular separation from the Sun increases. This angular separation, which is just the angle between the line joining the Earth to the Sun and the line from the Earth to the planet, is called the elongation of the planet. When the line from the Earth to the planet is tangent to the planet's orbit, the elongation has its maximum value and the planet is said to be at greatest elongation. At this special position Venus can be observed very well. western quadrature, when the planet is west of the Sun and forms a 90° angle with the Earth-Sun direction. eastern quadrature, when the planet is east of the Sun and forms a 90° angle with the Earth-Sun direction. 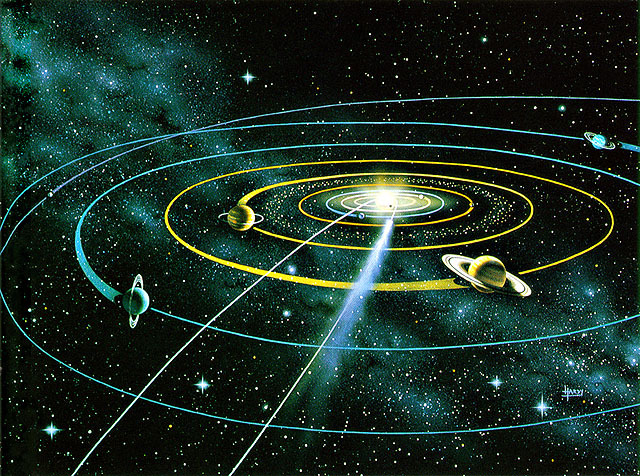 The planets orbit the Sun in ellipses, with the Sun at one focus. The line joining the Sun and a planet sweeps out equal areas in equal times. The period of revolution of a planet, and the semi-major axis of its orbit (half the longest dimension of the ellipse), are related to each other such that the square of the period is proportional to the cube of the semi-major axis of the orbit. 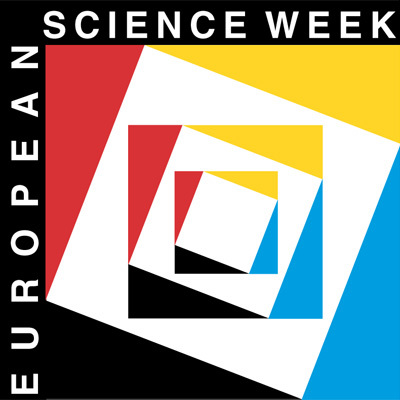 Kepler's laws were one of the tools which opened the door to the age of modern astronomy; the other was the invention of the telescope by Galileo Galilei nine years later and its use for astronomical research and observation.